Many people think that this is a current fad, but actually this diet was popularized in the 1990s and has been around since the mid-1940s. You might say it is tried and true. Many dietitians consider it to be a healthy diet, and I think you'll agree that it's delicious. The Mediterranean diet is heavy on olive oil, nuts or legumes such as soybeans or peas, fruits and vegetables, and unrefined cereals. Dairy products such as yogurt and cheese are consumed as part of the diet, as is fish. Wine also factors into the diet, which <!--more--> has helped its popularity! Red meat is not forbidden, but should be eaten rarely. Salt is discouraged, though herbs and spices are encouraged for flavor. 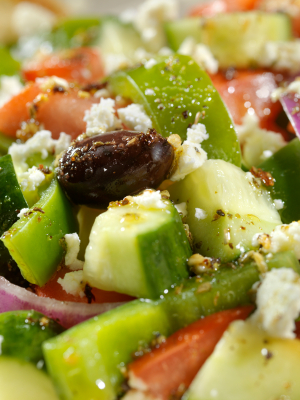 Research indicates that following the Mediterranean diet can lower the risk of heart disease and cancer. A 2008 study published in the British Medical Journal also showed that the Mediterranean diet can reduce the risk of Parkinson's disease and Alzheimer's disease; a 2011 study by the American College of Cardiology Foundation showed that following the diet lowers blood pressure.